My Robin Hood and Puck sites are intended for the free use of everyone. That said, I do have operating costs. And if you want to make a small donation to help pay for my webspace, domain name registration or just to say thanks for the hours of enjoyment ... who am I to say no? Clicking on the button below takes you to a page on PayPal where you can donate a small amount from your credit card or other means of payment. 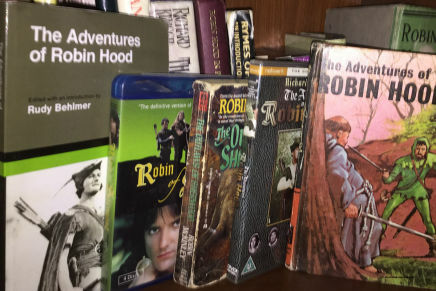 If you don't want to donate directly, various pages of my site feature Amazon links to Robin Hood books, TV shows and movies that you can purchase. At no additional cost to you, I receive a small commision if you purchase from these Amazon links. My Recommended Reading and Viewing page has many such links. If you do decide to donate, thank you very much. I hope my site has been informative or entertaining. If you're tired of the sales pitch, just hit the back button to return from whence you came. Or use the links below or the menu bar to navigate the Robin Hood site. If you came here from my Puck site, click here to return.